A narrow murram path leads to 30-year-old Cecile Asaji’s house in Kakamega town. Small stones painted with whitewash lie on each side of the path. Behind them, two lines of freshly watered flowers stretch all the way to the veranda. The petals have only begun to embrace the warmth of the sun. Curled up on her sofa looking relaxed and happy, Cecile is a warm lady to be around. But beneath her happy smile lies an undercurrent of despair, pain and rejection, only recently tempered by courage, hope and determination to once again reclaim her life. You see, Cecile is HIV positive, and learning to finally win against the demons that once haunted her after the betrayal of her once-loving boyfriend. Growing up the fifth child in a family of six, with an absent father, in Vihiga district, is where her story starts. “My father was a banker and my mother was a primary teacher,” she says. One month after her birth, her father left for the US to work and study, returning when she was 10. Cecile recalls that although she had uncles to look up to, she still missed a father figure. Nonetheless, Cecile’s life was otherwise stable, and in 1997, she joined St. Mary’s Girls’ School in Mumias. In 1998, at the age of 16, Cecile was struck by Cupid’s arrow. James* was a close friend of her brothers, and someone familiar to her since childhood, even though he was substantially older than her. In 2000, she joined M’mbale Progressive School in Uganda for her A-levels, but that did not deter love; James, who was in employment in Kisumu at that time, would often travel to see her. Cecile devoted herself to him, and dreamed of one day becoming his wife and the mother of his children. In 2003 she joined Kampala International University for her Bachelor’s Degree in Mass Communication. With more freedom and her own room, she could date and club as much as she wanted, but she opted instead to be faithful to James. Then in 2004, things began to fall apart. They began to squabble. His visits decreased in frequency. “I sensed that something was eating into my relationship,” Cecile remembers. Her friends thought there was another woman. Cecile sat him down and prodded him. “He claimed that his mother was very sick and needed to see some grandchildren (before she died),” she says. When her older sister had conceived out of wedlock their father had been very upset and almost kicked her out of the house, and so Cecile knew that the family would not take this kindly. But in the end, and at the age of 23, she gave in and conceived. However, the arguments she thought would end with her conception went on. To add insult to injury, her boyfriend began to see another woman. After returning to her boyfriend’s from the hospital, the break up that had been simmering burst out. 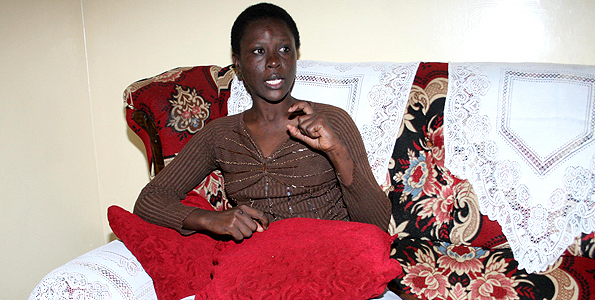 Heartbroken and in physical pain, Cecile returned to her parents in Vihiga where she lied that she had been staying with a student in hope that her dad would send her fees. In 2007, Cecile returned to campus for her final year. This time, she was sullen and withdrawn. “I could not accept the fact that my relationship had ended. I felt unlovable, undesirable and unattractive.” One day a man dropped by her room. “He said that his name was Chris* and some students in our row were his cousins.” They began to converse. “He asked why I didn’t know him, yet he knew me well. He claimed that he had graduated the previous year.” From that day on, Charles began to drop by her room. Then Cecile began to hear stories that her new boyfriend was a serial player. It also turned out that he had never had cousins at the university. But what really shook Cecile was a fellow student’s proclamation. Confused, Cecile stopped all physical intimacy with Chris two months after they had started. “I demanded that we go for a test, or there would be no relationship.” However, her boyfriend utterly refused and told her to go alone. A few weeks later, she began to develop blisters on her tummy. “The blisters came in tandem with strong fevers.” Her aunt, who was a medic, heard about her problems and advised that they visit the hospital together. “I hate jabs and I was very reluctant at first.” The tests came out positive for herpes. “I also tested HIV positive,” she adds, with a breaking voice. “I thought it was a joke. Hadn’t I gone for a test that turned out negative?” Her father broke the news to her siblings and other members of her extended family. “I felt really hurt,” Cecile says. In the following days, Cecile and her father could not see eye to eye. “There was cold hatred in his eyes whenever we met. He couldn’t stay in the same room with me.” Apparently, her father had a mistress who had repeatedly told him stories of Cecile being a husband snatcher in Eldoret town. He now believed that the stories were true. But a second thought told her that she would leave her first boyfriend, James, enjoying life. “I blamed him. If he hadn’t dumped me, I wouldn’t have been infected. Now I wanted to infect him and his wife.” They had recently gotten in touch, and Cecile decided to put her plan into action. Since he was once again showing interest in her, Cecile began to come around. “He apologised and promised to marry me as a second wife and love me more. He even bought piece of land where he wanted to settle me.” Her plan was perfectly falling into place. Through the group, she met an evangelist who became her emotional pillar, and a social support network of people living positively with HIV who gave her hope. This entry was posted on April 20, 2012 at 4:33 PM	and is filed under Features. You can follow any responses to this entry through the RSS 2.0 feed. Both comments and pings are currently closed. I see you say names have been changed………………How about the picture, has it been changed?